Manage your sending with one login. Get savings based on how many eligible parcels you send. Print labels from the convenience of your home, office or participating Post Office. The more you send with MyPost Business, the more you’ll save. Use our estimator tool to find out your postage costs, based on how many parcels you send and where you’re sending. Prices include GST. No hidden fees, no joining costs. Use your MyPost Business account to pay for postage online or instore. The parcels you send will count towards your sending volume – which determines how much you save. We’ll calculate your average weekly volume, based on how many parcels you sent within the previous 8 weeks (or 12 months – whichever gives you the greater savings). When you qualify for postage savings (based on whether you send 5+, 10+ or 20+ parcels per week), we’ll automatically add this to your account – so next time you send, you’ll pay the savings rate. Which eligible products can you save on? Which qualifying products count towards your savings? 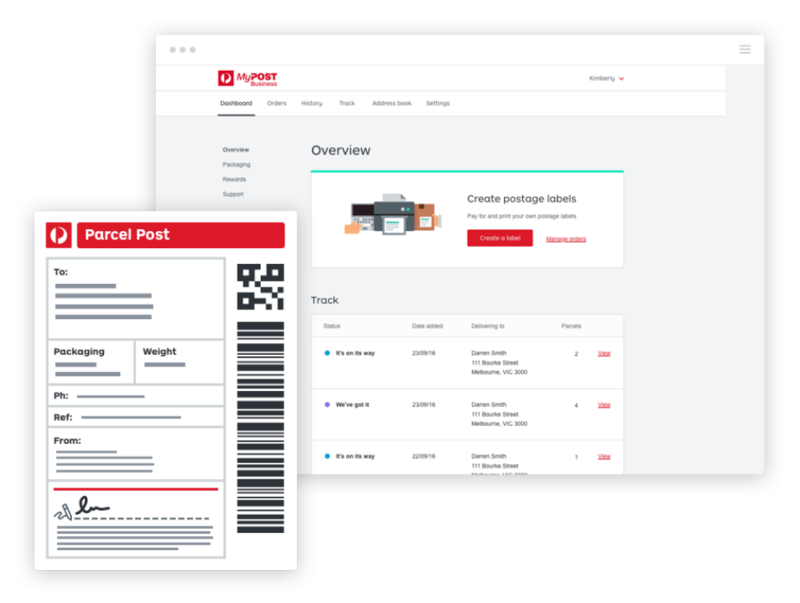 Make sure you scan your MyPost Business QR Code at the start of your transaction, so the parcels you send count towards your sending volume. Save time by importing CSV files or connecting to your eBay account, so you can quickly pay for and print out shipping labels. 2 Parcel pickups are $1 in select metro areas. We can collect up to 50 parcels at a time. Pickups between 9am and 5pm Monday - Friday, for orders placed before 1pm the day prior. 3 Track events will vary depending on how your item is lodged and delivered. Read more about our tracking service. 4 24/7 online chat support excludes national public holidays. Extended hours phone support available from 8am-8pm Monday to Friday AEST. Excludes national public holidays.